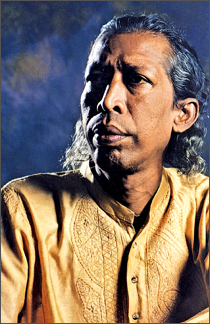 * Born in Thanabaddegama, Elpitiya in the Southern province on August 7, 1945. Visharada Gunadasa Kapuge, or Kapuge Master as he was fondly called within music circles, was a vocalist who emerged in the midst of great financial difficulties to entertain masses through his inimitable voice. A significant aspect regarding his music is that he blended life’s dramatic realities into song. He was one of the most successful singers that SLBC introduced to the world of music and his songs are still embraced by the public even after more than five years since his demise. He began his career at Sri Lanka Broadcasting Corporation (SLBC) in the late 1960s as an operational assistant in the recording section and was subsequently promoted on merit. His first breakthrough came in 1973 when his debut number Desa Nilupul Thema sung for a cultural program aired on SLBC. The song became a hit overnight and he won recognition as an A grade singer. Kapuge never called himself a Marxist but those close to him knew that his sympathies lay towards the ideology. He stood for a vision which believed in rising the human standard of living. Though he never used his academic qualifications to indulge in a world of mediocrity and dilettantism, forces worked against him and he had to undergo a punishment transfer from the main broadcasting station in Colombo to a provincial station in Rajarata also known as Rajarata Sevaya. Always one to look at the brighter prospects in life he took up the post good with a smile and under took the task of forming a better music unit for the radio station. He managed to bring out a whole new group of amateur vocalists to the spotlight. Many famous voices like those belonging to Karunaratne Divulgane, Jayathilaka Bandara, Senanayake Weralliyadda, Annesley Nanayakkara and Manel Rajakaruna were introduced by him. He even gifted the nation with talented lyricists like Ven. Pallagama Hemaratne, Mahinda Dissanayake, Mahinda Chandrasekara and Seetha Ranjini. 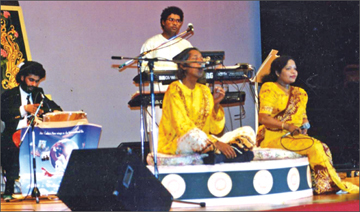 The master musician married Prema Withanage in 1978 and in 1980, he launched his maiden music cassette Dhampatin Laa Sandha with talented vocalist Malini Bulathsinhala. Interestingly Dhampatin Laa Sandha was the first cassette for both the two veteran vocalists who went on to churn out more captivating numbers for the music industry in the future. Kapuge released several more cassettes in his stint of three decades in the field of music. Most of them like Seethala Sandha Eliyae (1981), Unmadha Sithuwam (1983) and Piya Satahan (1990) became top sellers. His first contribution as a playback singer was for the film Ektam Geya for which he sang the song Unmadha Situwam. He was well versed in his instrumental music as well as vocals and the first stage drama for which he provided background music was Sugathapala de Silva’s Thuranga Sanniya. Kapuge’s earlier songs had a touch of romanticism but his later tracks embodied depth and realism. His songs had the power to move its listeners for he they carried meaningful messages. Another notable aspect of the master musician’s songs was the fact that he had the ability to lift and lower his voice while he sang. He staged a solo performance with a musical show named Kampana at Lumbini theatre on August 25, 1990, and also launched a cassette and CD with the same title. Though he won many awards including the Sarasaviya award in the most popular category, he was always humble at heart. His death occurred when he met with an accident at the Katunayake Airport after returning from a show in Dubai.